Newly engaged? This particular page is for Catholic couples who have long dreamed of saying “I do”, surrounded by family and friends in an exotic location: perhaps a sandy beach or beautiful old-world church, either in another city or even another country. Some websites we have seen claim that up to 25% of all weddings are now destination weddings. You may have even consulted a wedding planner by now, or no doubt surfed the internet to obtain information. As you’ve probably noticed there is a lot of information and, unfortunately, a lot of misinformation out there concerning Catholic destination weddings. Before you dive head-long into a destination wedding you need to be aware of certain things that will only apply to Catholics. So what are the unique challenges for Catholics planning a destination wedding? Because marriage is a Sacrament, Catholics cannot just get married anywhere, or by just anyone. Canon 1118.1 states that a marriage between two Catholics, or between a Catholic and a baptized non-Catholic, is to be celebrated in the parish church, although permission can be granted for it to be held in a different Catholic church or chapel. So this has to be your first concern: not impossible, but needs to be planned out in advance. 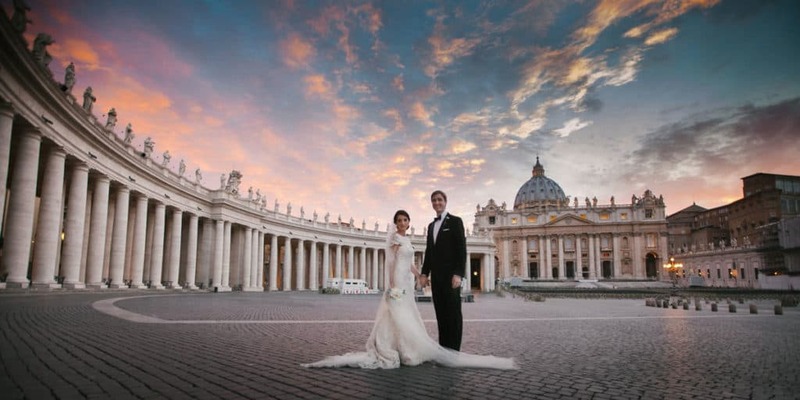 Click here to see what typical steps must be taken for Catholics to plan a destination wedding. ⇒ Lower Cost: Since the number of guests will undoubtedly be smaller, the cost of the wedding (reception, etc) will probably be less. ⇒ Simpler: Odds are that you will be using a wedding planner if you are not getting married locally, and most planners have pre-designed packages that only require a few decisions on your part. ⇒ Relaxed: Also, enjoying the convenience of a wedding package that includes everything the couple needs allows them to enjoy the day and relax. ⇒ Guests might prefer it: Some guests may welcome the chance for a mini vacation combined with the wedding. ⇒ Higher Cost: Wait a minute, we mentioned lower cost as an advantage above, so why are we now listing as a disadvantage? Part of that depends upon the size of your wedding party and who is paying for what. There are those who claim that a destination wedding can actually save you money overall, by combining the wedding and honeymoon all in one package. In some circumstances this may be true, but not necessarily so. Rome, for example, will be far more expensive than a wedding back in your home parish. And if you are paying for the wedding party’s travel and lodging, that can easily add up to quite a bit. There goes that money you thought you were going to save! ⇒ Legal Requirements: You will definitely need to find a reputable Wedding coordinator to help with the legal red tape and is familiar with the requirements for a Catholic wedding, especially if you are getting married in another country. ⇒ Some of the those people who are most precious in your life will not be there for that special day. Not everyone can afford to take time off from work, the cost of long distance travel, lodging, meals, and other expenses. Also, consider that older relatives or friends who would love to attend, may not be able to travel so far away from home. ⇒ Some out of town..or out of country…churches may not want you to hold your wedding there. After all, a member of that parish may want their wedding on the same day, and you will be taking that away from them. So better find out ahead if that is the case. Some parishes now require a deposit due to the fact that an out of town couple arranges for a wedding there and then the wedding is called off, but no one notifies the parish, meanwhile a member of that parish that wanted that date was turned down. ⇒ Last, but not least, the two of you won’t have as much time alone as you might think. Your guests will not always be off doing other things, or you may feel responsible for ensuring that they have a good time. This can take some of the joy and spontaneity out of your honeymoon. These downsides may not even apply to you. And there are lots of exceptions, but our goal is just to help you through an exciting but stressful time. Certainly with careful planning and patience a destination wedding can be your dream come true. Have we discouraged you? If not, then a destination wedding is probably right for you……go ahead and plan that destination wedding. You know the possible pitfalls, so you are well ahead of most people, and with a good wedding planner, you should be able to pull it off. And there a lot of of pluses as well as the few minuses we have mentioned. Ever been involved in a destination wedding? Any advice you would like to give? Please let us know.